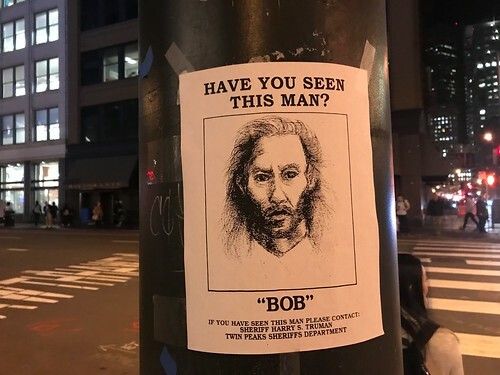 While waiting to cross the street outside the LinkedIn building, I noticed a wanted poster taped to a light post and did a double take — it’s a recreation of the Killer BOB wanted poster from the original Twin Peaks. The poster implores you to call Sheriff Truman if you’ve seen BOB. If you’re unfamiliar with the surreal crime drama, BOB is an evil spirit of sorts who possess people. In his physical manifestation he was played by Frank Silva. Silva does have a connection to San Francisco as he had a degree from SF State. Unfortunately he died back in 1995.